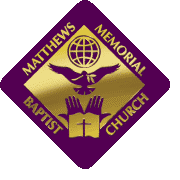 Welcome to the Matthews Memorial Baptist Church Online Community site. In fellowship with Christ and ministering in His name, the Matthews Memorial Baptist Church exists for the purpose of i) Worship, ii) Evangelism, iii) Fellowship, iv) Missions, and v) Christian Education. We are the church that is empowered to love and challenged to lead a multitude of souls to Christ. Through the power of prayer, the gift of the Holy Spirit, expository teaching and preaching, the Mathews Memorial Baptist Church is committed to learning how to demonstrate the love of God in and through Jesus Christ so that we who are called by Him will be equipped to: Glorify God, Exalt Christ and Edify People by Empowering them to be Kingdom-Building Disciples throughout the District of Columbia and the world for Christ.